Oh, Hello! That's more than a greeting now - it's a new stamp set from Stampin' Up! This is another card that I made to swap at Leadership. Since we drove down to Florida, I wanted to have something to work on in the car, so I deliberately planned this card to cut out the flowers. I like cutting things out - I find it relaxing. Plus I only made about 50 of these cards, so that was only 100 flowers. I used a little different technique to get the design on the middle oval to look like it does. 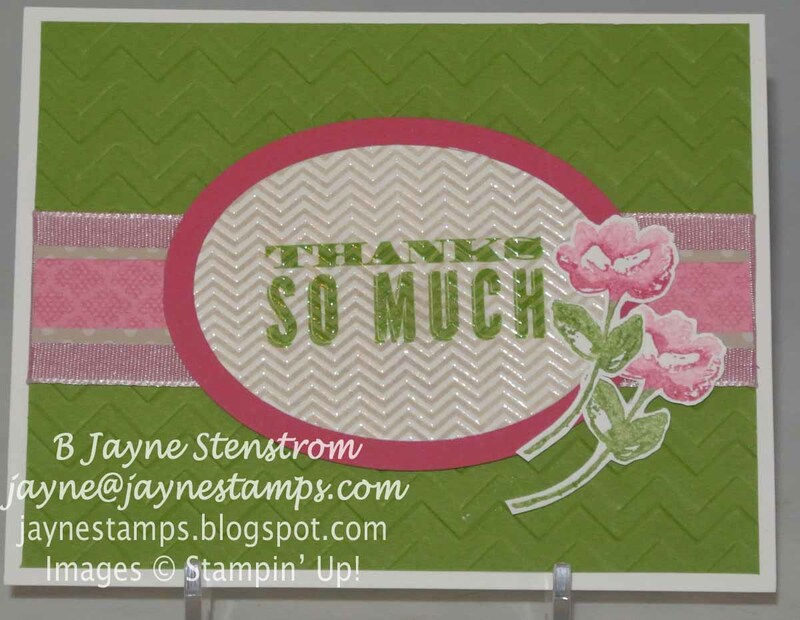 I stamped the "Thanks So Much" onto Whisper White cardstock in Gumball Green. Then I inked up the oval with the chevron pattern in VersaMark ink and stamped it over the top. I sprinkled clear emboss powder on top and then used my heat tool to melt and set and emboss powder. Then I took Crumb Cake ink and a stamping sponge and sponged over the top of the embossed area. I love the way it turned out!